Here is a basic block diagram of how FPV works. You can also check out our other article on FPV. 1. Mobius Sport Camera – with usb to video take-off. This cable is sometimes included with the Mobius when you purchase it. However, if it did not come with your Mobius, you can purchase it from this link. 2. Transmitter to beam the video signal from the Mobius from the air to the ground. I used a popular 5.8 GHZ 200 mw model called the TS351, sold by Boscam and various other vendors. Note: The Transmitter requires power – either from your existing quad battery or from an additional small battery which you can add. It has a range of voltage it can accept from 6.5-15V. The three above are grouped together because you can get a single unit which performs all three functions. I used this one – however, there are other brands which have good reputations. 6. Misc solder, heat shrink, etc – and, to power the TX at the quadcopter, you’ll need a female connector to take power from the battery balance connector. If your battery is a typical 3s (Phantom, Blade 350, etc. ), get an extension with this description – JST JST-XH 3S Balance Wire Extension. Total cost for this small project, assuming you already have a Mobius or other camera (GoPro, etc.) with a composite video output, is less than $200. NOTE: make sure you leave enough wire on the various harnesses to mount the camera and TX on your quad. You can zip tie or rubber band extra lengths of wire. The 200mw transmitter comes with two wiring harnesses which plug into matching receptacles in the rear of the unit. One plug contains two wires – a red and a black. This is the power supply cable and needs to be wired to a DC power source of between 7 and 15 volts. Since the 3S batteries used in mid-sized quadcopters are approx. 12v, the existing battery provides an easy way to power the TX. By connecting combinations of wires from the balance connector, you can obtain either 3.7, 7.4 or 11.1 volts – useful information both for this project and for your future needs. Most balance connectors use the following wire colors. Using the female of the JST-XH 3S Balance Wire Extension, cut all 4 wires a few inches down from the plug – then cut the yellow and blue wires shorter (these will not be used) and cap them off with a piece of heat shrink to avoid possible shorting. Strip the red and black wires and solder/heat shrink them to the red and black of the TX power supply wiring harness. You’ll have to cut the existing (red plastic) connector off first. Plug the power supply into the TX and the other end into a 3s battery and the LED light on the TX circuit board will turn on. The following is a picture of the battery balance connector (left) connection to an extension which then goes to the FPV transmitter voltage input (power in). Cut off the RCA yellow connector from the Mobius Video-out harness and strip the wires further back. Another option would be to install the opposite RCA connector on the TX wires, but that will add some weight. The TX Video in plug contains 5 wires – you only need two of them – the yellow and the black. Twist and connect (solder and heat shrink) these with the matching yellow and black wires from the Mobius. Test before mounting on your quadcopter – turn on the Mobius and plug in the usb video-out – power up the TX by plugging it into a 3s battery balance charger. Turn on the Monitor and scroll through the available receiver channels to find the one which the camera is connected to (you will see whatever the camera is pointing to). Note that both the camera and the TX module have a number of exact frequencies which they can be set at – they must, of course, match. It may be that a specific combination is better for your choice of (optional) more advanced antennas or even that a certain combo works better in your flying area. You can experiment with different channels after you get the basic setup working. Use your favorite materials and mounts to secure the TX module and other wires so they will not get caught in the propeller blades and so that the antenna is able to be adjusted to various angles. There you go! It’s as simple as that to get a basic FPV setup working. Depending on your exact setup and desired range you will likely have to do some tuning, experimentation and shielding. Cloverleaf antennas can be a great upgrade to the basic ones included with this kit. The tuning and mounting will be very dependent on the exact Quadcopter model you are installing your FPV setup onto. I used a Blade 350 QX for my first flights and will likely try it on my Phantom 1 models soon. I’ll report back with any tweaks and comments after I get some additional time in the air. Videos and pics below (more coming soon!) show the maiden flight in the backyard and a quick flight at the local school field. I took the rig to about 100 meters with a perfect picture still on the monitor. Various brackets and harnesses are available to mount your FPV monitor on top of your R/C Transmitter. One company makes a shoulder hung harness which allows the monitor to be closer to eye level and adjustable – completely separate from your R/C controller. I’m going to try several methods and will report back with my findings. I used an older chest-mount strap I had as the basis for a monitor holder which would place the screen closer to my eyes. A picture of it is below. The Mobius is fairly well behaved when using FPV – it will not turn itself off (to save energy) as it normally would if you are not actively taking pictures or videos. The FPV works well in video mode, although others have reported that latency (the speed difference between when the camera see something and you do) is much less if you use the 720p mode. Also, if you use the intervalometer (still photos every X seconds), you must set it on at least 5 seconds between each picture – I had mine set on 2 second with poor results…the pics come out fine, but the FPV monitor shows a lot of static and video interruptions. Update: I set the Mobius on 5 second intervals and I still get some static when it is taking the picture(s). This article is just an introduction – there are literally thousands of posts online about using this camera and FPV if you want to delve further into an aspect of various setups. Don’t want to do it yourself? There are now some full featured FPV quadcopters – all set up including Remote, Monitor, batteries, etc. – for as low as $300. One that we suggest is the Eachine 250 – check it out here. This is a hobby grade machine – the really cheap “toy grade” FPV machines which sell for less are somewhat disposable – they use cheaper motors that burn out after a couple dozen flights, etc. Here is our review on the Eachine – and also a review on the Hisky HM280, which can also be set up for FPV. Note that these machines are usually not for beginners – they are fast and take some talent to fly correctly! 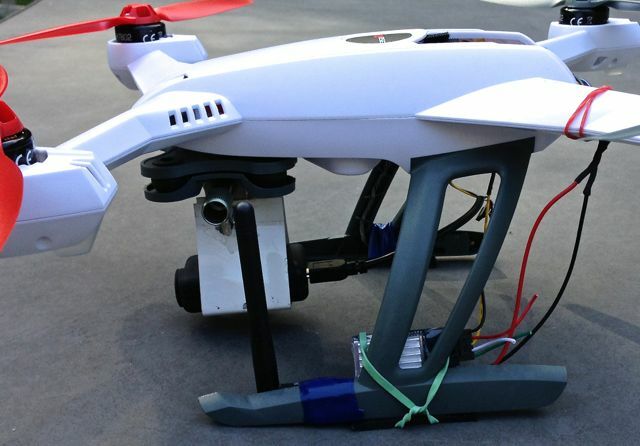 We also tested the Walkera Runner FPV – and it proved to have shortcomings so we do not suggest it at this time. Note – “toy-grade” FPV machines (with brushed motors) are not going to provide a good experience due to the motors burning out regularly.